This area was identified as Parkview on maps of Detroit through the early years of the last century. The first homewas built on the street known as Parkview by Marvin M. Stanton, beginning in 1898. He was a Detroit clothing manufacturer who, presumably, had the desire to live in a unique castle-like residence. He commissioned Detroit architect Louis Kamper to design an unusual assembly of turrets, towers, crenellations and roofsthat stands to this day. This is well known as The Castle. I have been giving tours of Detroit for about adozen years. Every time I have driven by The Castle, I have seen a “For Sale” sign. Mr. Stanton also commissioned a similarly elaborate coach house for his livery staff and horses. Next door, he arranged for the construction of a much more modest clapboard home on Parkview for his son, Marvin L. Stanton. In July, 1914, Detroit Common Council approved the platting of the Joseph H. Berry Subdivision. 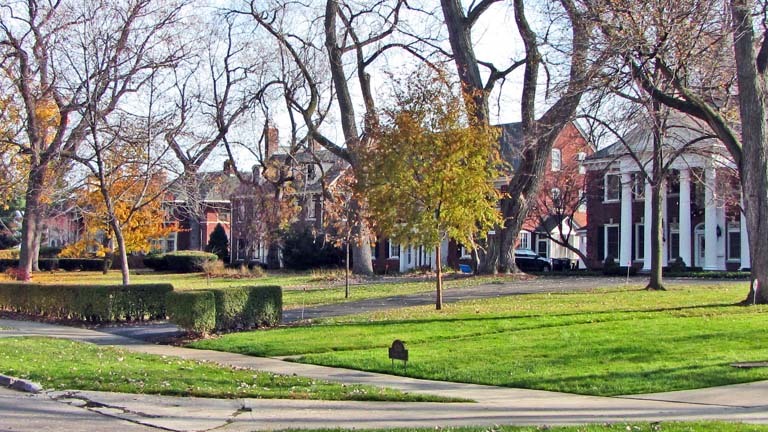 The daughters of Mr. Berry had inherited this land and wishedto invest in a development that would provide substantial homes for those many Detroit residents who were amassing wealth thanks to growth of the vehicle industry. In 1914, I believe, the only residences in the subdivision were three that Marvin Stanton commissionedon Parkview. As early as 1916, homes were built in the subdivision. 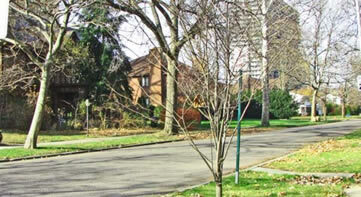 The choicest lots in the subdivision are those that face the Detroit River and Belle Isle. In the early 1920s, seven impressive homes were erected there. The five homes to the west were designed by Joseph P. Jogerst and may have been an investment by the Webber family who, at that time, had financial interests in the Hudson Department store. 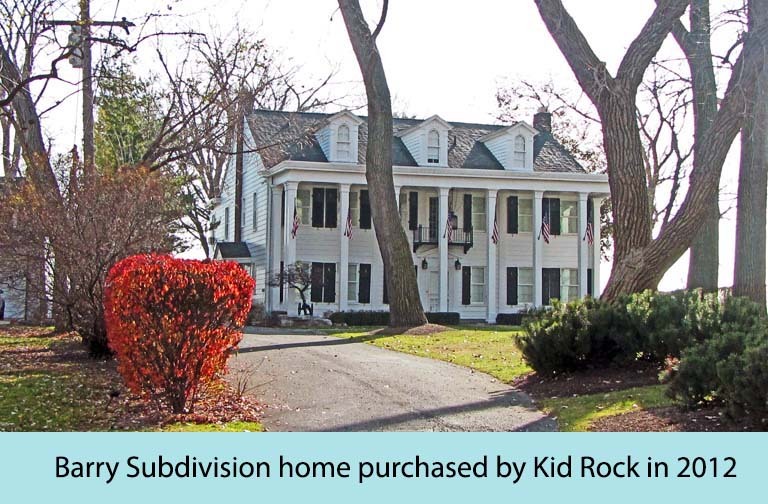 One of those fine homes is now the Detroit residence of Kid Rock. 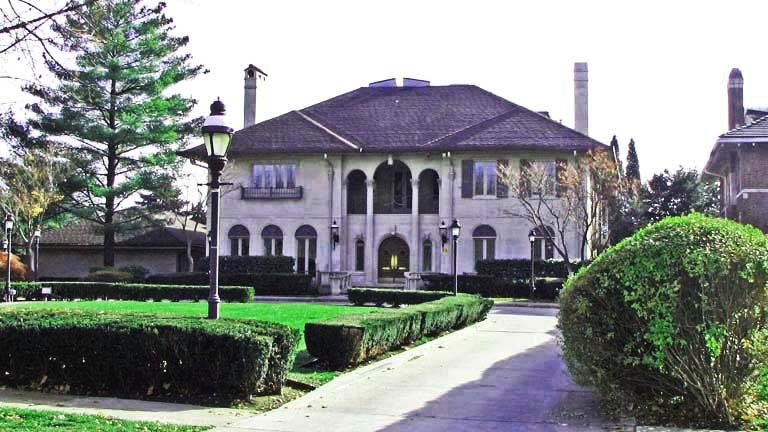 The easternmost home facing the Detroit River on Dwight Street was built for General Charles W. Harrah but was purchased by Alex Manoogian in the late 1930s. He donated his home to the city and Manoogian Mansion now serves as the official residence of the mayor of Detroit. Mayor David Bing and Kid Rock now live in this subdivision. In the past, a number of other well-known Detroit residents have done so. Two members of the Ford family—the glass Ford family not the automobile Ford family—built homes here: John B. Ford at 360 Lodge and Fred S. Ford at 444 Lodge. Both of those homes were designed by Robert O. Derrick. John Kay who founded the Wright-Kay chain of retail jewelry store had the architects Donaldson and Meier design a home at 400 Fiske. Perhaps Detroit’s most successful burlesque entrepreneur was Arthur “Pop” Clamage who had an impressive home built at 541 Lodge. The Depression put an end to construction in the Berry Subdivision. I infer that fewer than one half of the 116 lots were occupied in 1929. After World War II, some additional homes were built here but there are still many unoccupied lots in the subdivision. The Parkview Apartment Building at 590 Parkview, designed by Samuel E. Remey and built in 1921, is withinthe Berry Historic District.